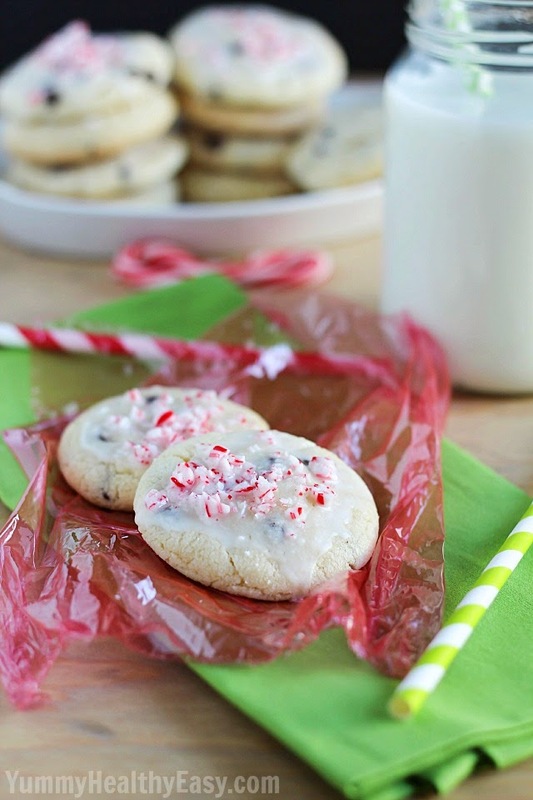 We are continuing the yummy peppermint theme today with Jen from Yummy Healthy Easy who is sharing her recipe for Peppermint Chocolate Chip Sugar Cookies. Enjoy! Hi everyone! 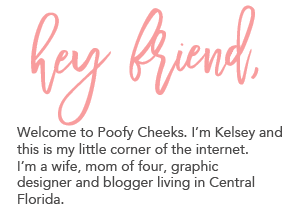 I’m Jen and I blog over at Yummy Healthy Easy. I’m super excited to be here at Poofy Cheeks today to share a Christmas cookie recipe with you! So…I have 4 boys. They’re always hungry. So cookies, like these above, don’t really last long at my house. My oldest is a crazy fiend for sugar cookies, while my 9-year old is all about anything with chocolate chips, particularly chocolate chip cookies. My younger two will just about eat any cookie, regardless. This recipe is a favorite because everyone loves it! 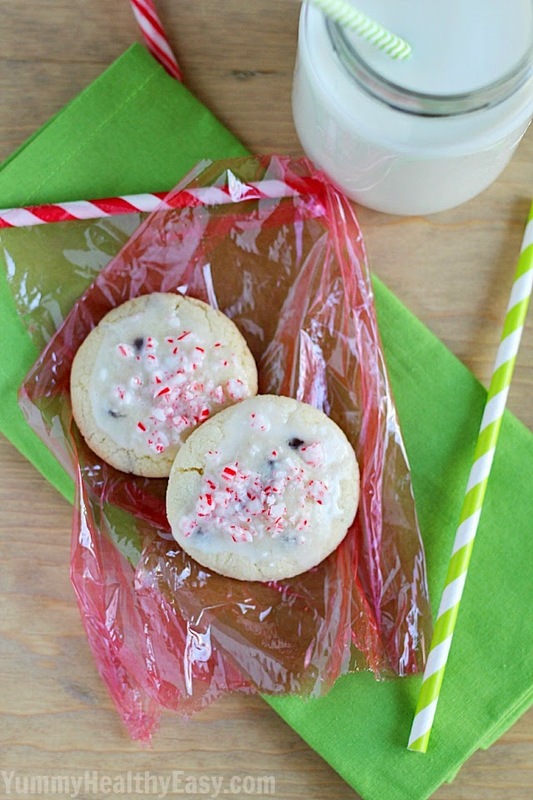 You get more of a sugar cookie texture and flavor but with some mini chocolate chips thrown in. Plus everything tastes better with peppermint, in my opinion! One of the things I hate about sugar cookies, is the amount of time and effort it takes to make them. You have to make the dough, roll it out, cut it out into shapes, bake, cool, frost, decorate…that’s so much work! 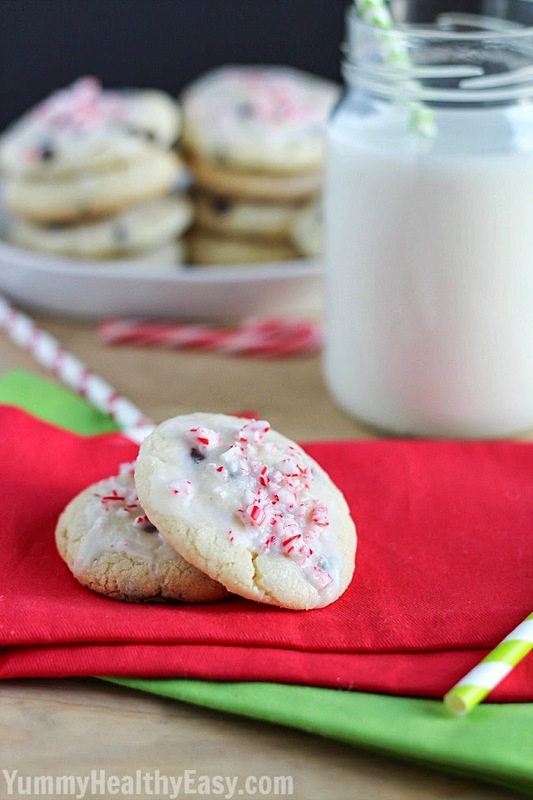 With this recipe, you’re getting the flavor of a sugar cookie but without all that effort. The dough is quick and easy to make and you just roll it into balls then throw it in the oven. Make a quick glaze to spread on the tops, sprinkle with crushed peppermints and you’re good to go! These are perfect to put in a cute gift bag and give to neighbors or keep them all for yourself to eat with a cold glass of milk. I hope you enjoy them as much as my family does! Preheat oven to 350º. Make sure racks are placed in upper and lower thirds of the oven. Combine flour, baking powder and salt in a small bowl; set aside. In a large mixing bowl, beat butter, granulated sugar and 1/4 tsp. peppermint extract on medium-high until fluffy (about 3 minutes). Beat in egg, then flour mixture on low. Stir in chocolate chips. Roll dough into 1-1/2 inch balls and place 2 inches apart on parchment lined baking sheets. Bake until lightly golden, about 12 minutes. Rotate sheets around about halfway through cooking. Let cool on sheets for 5 minutes and then transfer cookies to wire cooling racks to let cool completely. In a small bowl, combine powdered sugar, 1/4 tsp. peppermint extract and cream or milk to make the glaze. (If too thin, add more powdered sugar to get the consistency you want). 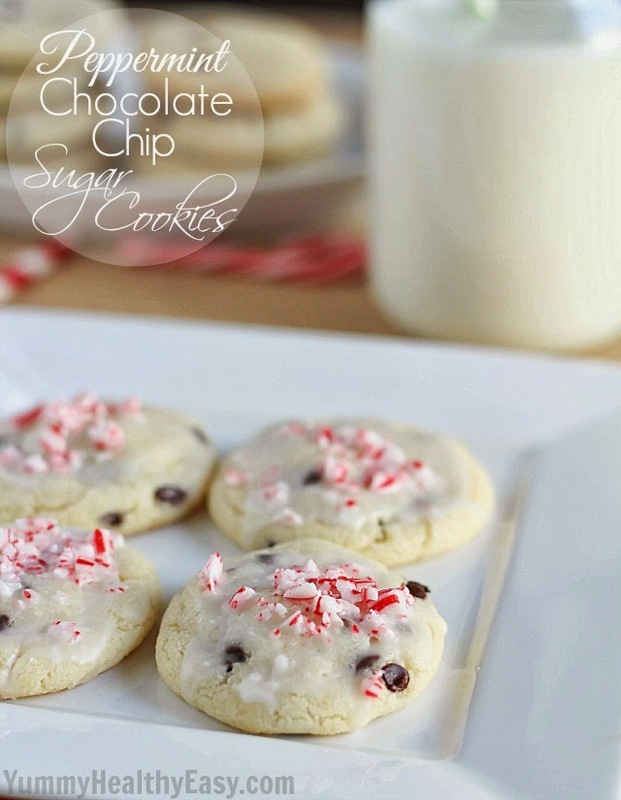 Spread a thin layer of glaze on top of each cookie and sprinkle with candy cane crumbs. Let dry completely on racks and then devour. Enjoy! Thanks for having me here today! Stop by and visit me soon! what would two sticks of butter equal? Omg, these look so delicious. This will be on the list of cookies I'll be making this Christmas!